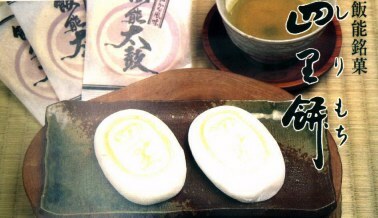 Osatoya is famous for shirimochi (sweet bean paste covered inside a rice cake). People who come to Hanno to play golf often buy it. Even a famous Japanese comedian buys it. Toraya is a curry shop. The curry is very delicious. The same family has managed the restaurant for over 30 years. 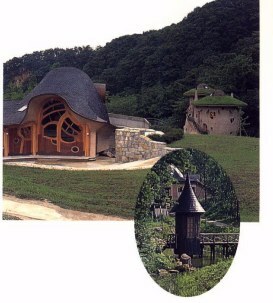 Akebono Park has a model of Moomine's house. Moomine is a popular Japanese animated character. It looks so neat! It has become a new symbol of Hanno City. 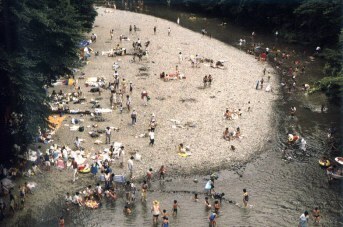 People swimming in the river at a popular picnic area. 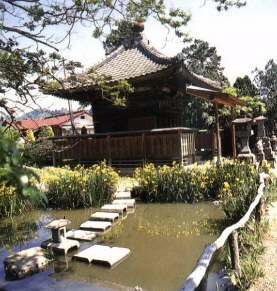 Enjoy the peace and qiuet around a shrine.